SOULspace: Books For Sale...at the Carnival! Yes, finally got to put this post up!! 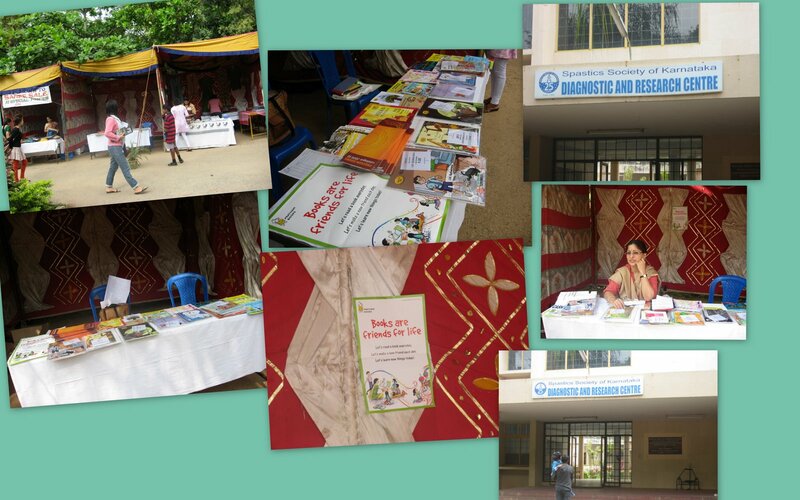 It was carnival time at SSK, and I have been canvassing Pratham books for some time here. So decided to get a stall and sell the books!! The folks at Pratham Books were very sweet, not only did they support my eccentricity they had done a great job too. The books arrived all packed in sets of 5 to 6 books, costing 100 to 115 only! Thanks Sanjay! I really believe the low cost books are amazing in their simplicity of story, and classy in terms of paper quality. Ideal for children who are first time readers/learners of the English language. I also found a friend in need! Rajini, a Librarian with many years of experience and many more years of passion for books, sat with me at the stall. She too volunteers at the school as the resource room in charge (perfect don't you think?!. That's her in the picture. Terrific saleswoman too, asking and yelling to all sundry to buy Books this Christmas! I'm happy with the timing of the post. I got a book-shelf for my son last weekend to hold his present collection and wanted to gift him more books this new year. Let me see! Thanks! Hi Sowmya! Thanks for spreading the word about Pratham Books. We wouldn't be where we are but for the support that we get from our well-wishers! Happy New Year!